I swear that I am going insane. Sitting quietly in my office working and I keep hearing a bird hooting. It sounds like an owl but it's 12:30 in the afternoon. I went out and looked around on my break but I didn't see any owls. Very strange. There are times that I can just truck along and my fibro doesn't really effect me other then all over body pain and lack of energy. There are other times when it targets certain areas of my body. Usually it's my legs which since I don't work on my feet, I can deal with. Right now it is attacking my forearms which makes typing difficult if not impossible. After about eight hours at work, it's enough to bring tears to my eyes. I am so done with this crap. Please find a cure. I need one. I think that I am addicted to artisan head pins. 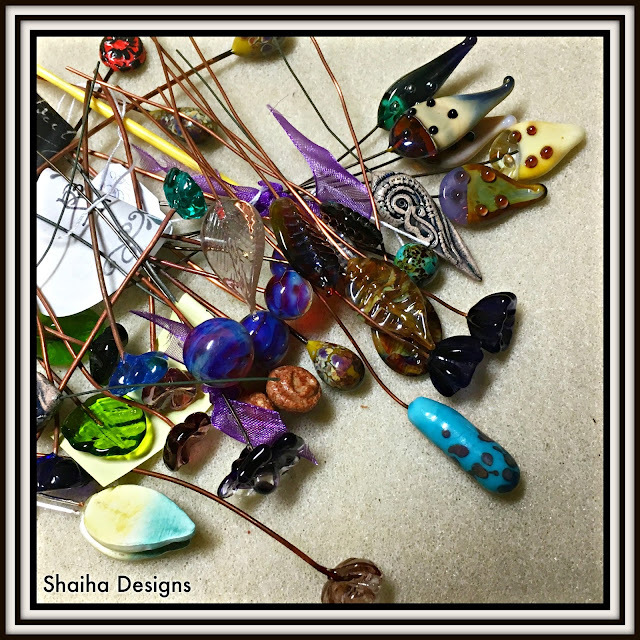 They are so great for necklaces and almost ready made earrings. The only problem is that I tend to hoard them rather then use them. Perhaps I have a dragon in my background.